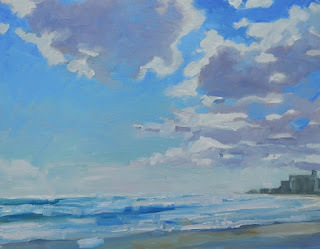 During each plein air event I try to do one painting that is my "Magnum Opus" . I went back to Riverbend Park where I did my best painting last year. (see it HERE) I went early in the morning following my strategy of getting to a location early and then spending the day completing as many paintings as possible thus avoiding too much wasted time driving around looking for subject matter..
As I was walking around with my coffee trying to match the idea of a composition I envisioned in my head with what I was seeing, I noticed the moon rising above this group of palms. I loved the way the early light was creating shadow patterns on the trunks ..and the moon was a bonus. Realizing this effect would not last long I immediately ran for my gear and set up to render the scene. It was very quiet, very beautiful and no one was around to distract me. I was really enjoying the moment!! Painting a moon into a scene like this is trickier than it would seem. I did a lot of "pushing and pulling of the paint to get it to fade into the sky like I was seeing it and not just pasted onto the surface. It must be as perfectly round as you can make it.....and that in itself can be a challenge. I also made sure to pack some tall skinny panels because I knew that there would be tall palms I would want to paint. This panel was pre-mounted in a black "floater" frame. The frame part was then covered in brown paper allowing me to make the painting and then remove the paper....Shazaam! 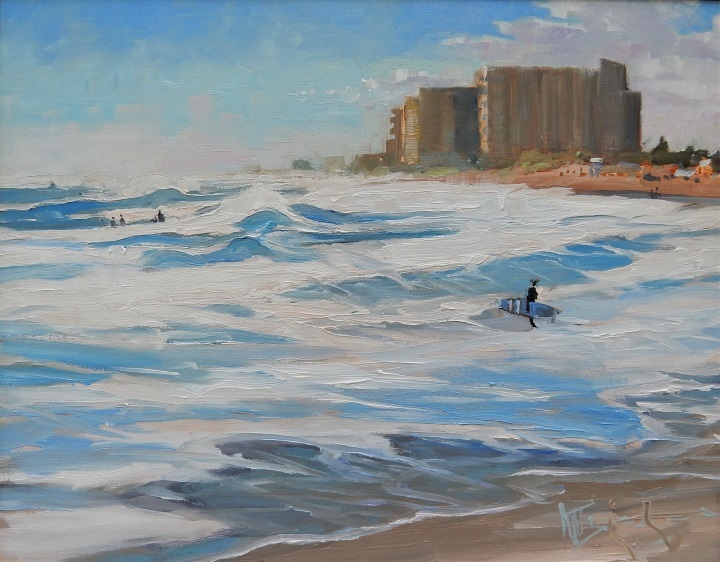 ...A completed, ready to hang, hopefully, winner painting....It didn't win any awards but it did sell..
Hopefully this will encourage you to get out and paint your "Winner" too! 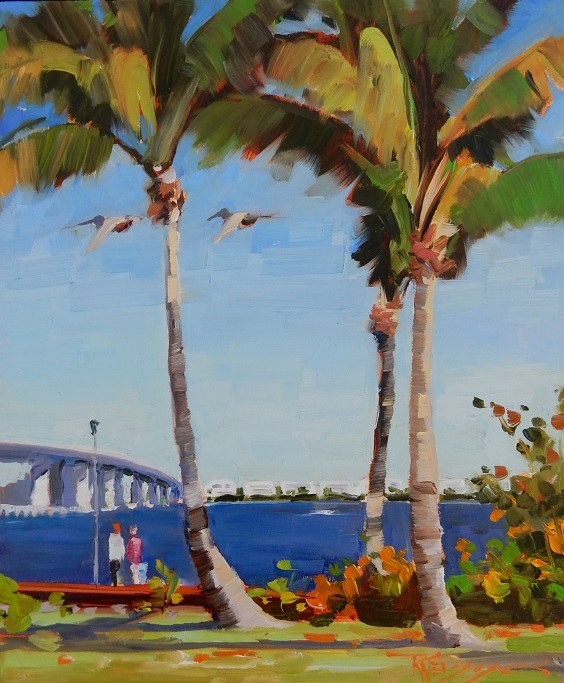 This was the last painting completed at Duboise Park during the 5th Annual Plein Air Festival. It is a similar composition to one that I did last year. There was a perfect focal point in the foreground when I set up but unfortunately they packed up and came over to see what I was painting....Such are the challenges of painting on location! 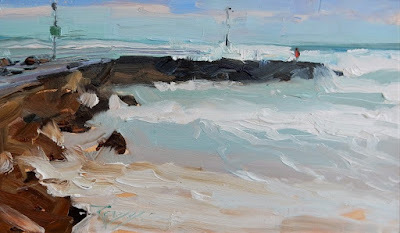 !.....Maybe someday I'll get good enough...or brave enough to add in to a plein air painting, complex elements from memory. 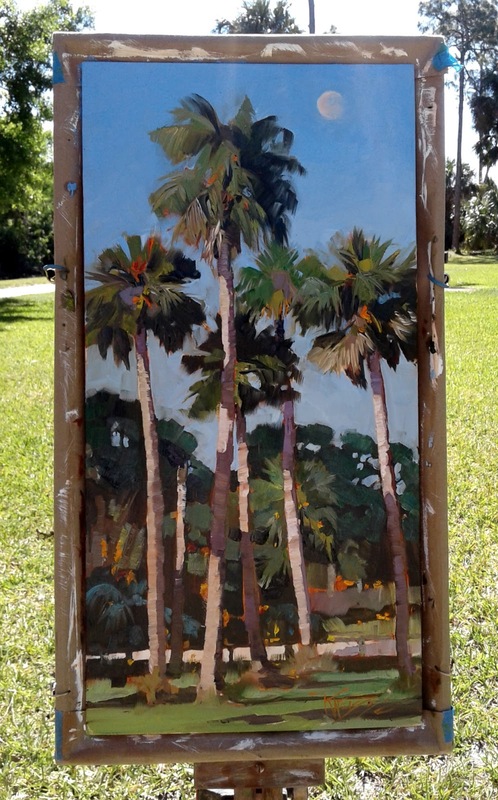 After laboring over a larger painting of the Florida coast at Duboise Park during the 5th Annual Plein Air Festival (see last post) and being somewhat frustrated that I couldn't translate the feel of the ocean,sky misty mix of atmosphere...I turned my easel in another direction and painted a smaller,quicker more immediate study...On this one I was working more on close observation of value and movement and then laying down brush strokes reflecting those visuals and letting them stand. I was more satisfied with this result and so was the collector who bought it...but it doesn't always work out that way when you paint in this manner. The risks are higher but so are the rewards! Duboise Park was a favorite location from last years Lighthouse Art Center plein air event and I wanted to go back there. Recently there had been a very powerful storm hit the east coast of the US and the effects of that storm reached all the way down to South Florida, creating surf that wasn't to much fun for swimmers but great for local surfers. 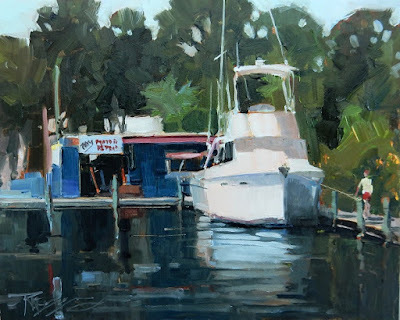 One of the great things about attending these plein air events is meeting other artists and folks that are interested in art. I kept running into Ralph Papa at the locations I was painting and got to know him a little better. Ralph is a great artist with his own gallery. 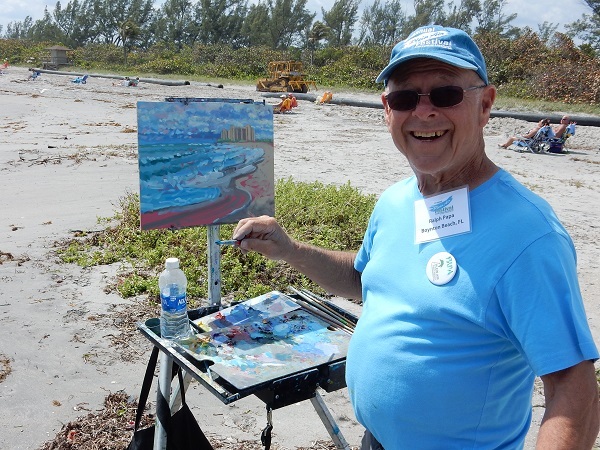 His warm smile and positive attitude make for fun times painting and hanging out. On the way back from Port Selerno I stopped at a location that the event photographer suggested called Sandsprit Park. It was pretty late in the day but I found a scene that worked for a long narrow composition. What was amazing is that the two people fishing on the dock stayed until I was mostly finished with the painting and that never happens! Labels: 5th annual plein air festival, Florida oil painting, Sandsprit Park. 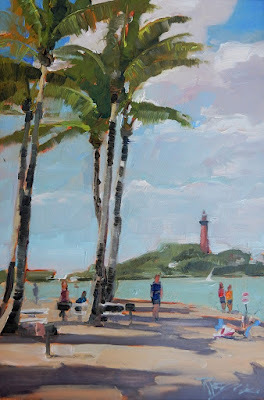 The 5th Annual Plein Air Festival was my second time competing in the Lighthouse Art Center event. 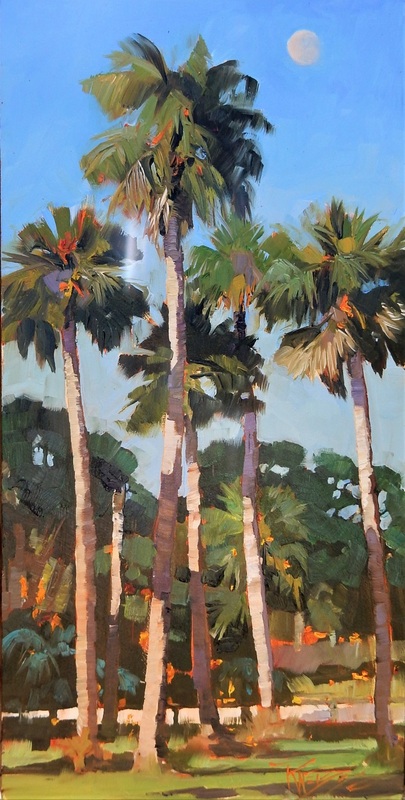 I wanted to paint in a location that I didn't get the chance to last time. My strategy (and you do need a plan in these events!) was to head to the farthest location and then work my way in closer to Jupiter as the week progressed. I never made it to Port Selerno last year so early Monday morning after stopping for coffee I headed north. 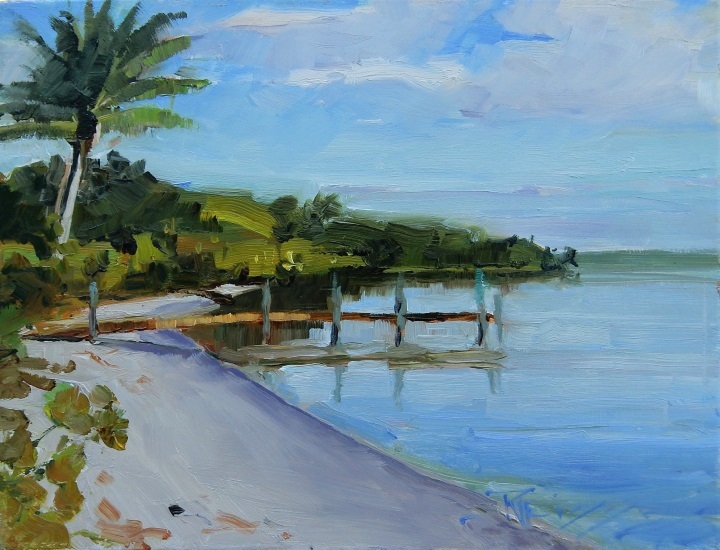 The day was beautiful and the morning clear and bright, couldn't help stopping on the way at a nature preserve called Hobe Sound to warm up with a small painting. After a short hike through the palmettos I arrived at this quiet and peaceful beach. 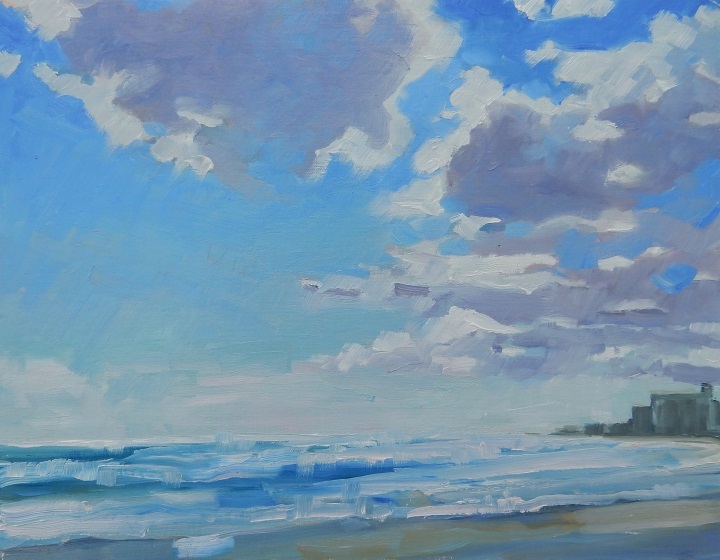 Port Selerno is a painters dream! 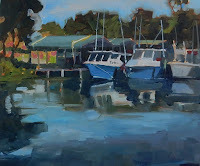 lots of boatyards, marinas and old stuff! Just what I was looking for. I found a spot out at the end of a dock where I had two good views to paint. I wasn't too happy with the first painting (left) and considered scraping it but in the end decided to wait till the morning. Sometimes it's better to cut your losses and start a new painting while you are still fresh and that worked out for me this time. I turned my easel and painted the scene at top, "Phil's Motor Repair", Sold that same day in the gallery. I touched up "Port Selerno" next day and improved it enough to keep as a good memory of a fantastic painting location in South Florida!....or sell if you like it.. =] I am trying to make a living off my dream job.. I also had a great time seeing artist friends from last year and meeting new friends. The talent represented in this event is amazing, inspiring and humbling!